The best way to keep your car protected from sun and rain all year round. Sick of clearing leaves and muck off your car each morning? Frustrated by rain showers ruining your careful cleaning job? Hate the stuffy, burning feeling of an overheated car? 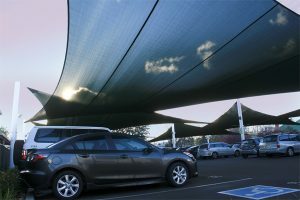 A high-quality shade sail could be the answer to all your problems, keeping your driveway or car park covered to protect your car from the sun, light rain and other environmental bothers. By installing a shade sail over your driveway or car park, you can create a comfortable shaded area that will keep your car clean and prevent it from becoming overheated in hot weather, making life easier for you. Different shapes and sizes are available so that you can choose the best shade sail for your needs. Lightweight materials allow easy handling, installation and removal, and expert construction means that your shade sail can last up to 10 years. Not every car owner has the same needs, so we’ve got a range of different products available to suit your circumstances exactly. Whether you have one small Smart car or five huge four-wheel-drives, there’s a shade sail perfect for your driveway or car park. Shade sails can range in size more than you’d imagine, so no matter what your needs and purposes are, we’ve got a sail in the right size and dimensions to give you exactly the cover you want. Keep your driveway or car park covered the way you want with a range of different shaped shade sails from square to triangle to cater for all different tastes and purposes. Whether you’re concerned about keeping your driveway looking stylish or interested in using the heat absorption properties of different coloured fabrics, there are enough choices for you to find exactly what you need to cover you car. After you’ve chosen the best shade sail for your driveway or car park, it needs to be installed. Luckily, we offer two great choices to make installation as simple and hassle-free as possible: an affordable and reliable installation service for all suburbs across Melbourne, or clear and easy-to-use do-it-yourself kits that offer everything you need to install your own shade sail successfully. Our high-quality installation service is available to all suburbs across Melbourne, quickly and efficiently installing domestic and commercial shade sails at an affordable price. All our installation staff are experienced with shade sails and guarantee a successful construction, offering you maximum safety and protection. What’s more, we offer a free consultation, measure and quote on all jobs. If you’d rather install your own shade sail, we make it easier for you by supplying everything you need for a successful construction. Helping to make your installation experience as stress-free as possible, we provide all the fabric, posts, fixtures, fittings and structures you need, complete with clear instructions to help you complete an expert job by your own hands. Give your car the best protection by covering your driveway or cark park with a high-quality shade sail.